My kids love making slime and we’re working our way through sharing some of our favorite slime recipes. They had a request recently and it was one we hadn’t tried before! They wanted to make edible slime! Yep, they wanted to be able to play with it and then eat it. This obviously meant we needed to take a different approach and make non-toxic slime. Candy slime became the obvious plan because who doesn’t like candy? Read on to see how we took one of MY favorite candy gummies and turned them into edible slime! Be sure to leave a comment and tell us what kind of candy slime you would make! There’s just something about Swedish Fish. They can only be in our house once in a while because I will eat the entire bag! But making edible slime was the perfect excuse for picking some up! I might have snuck a few while we worked on this DIY edible slime recipe… maybe. But anyway, back to the slime recipe. Before we start, there is one thing I want to make very clear about making edible slime out of candy. 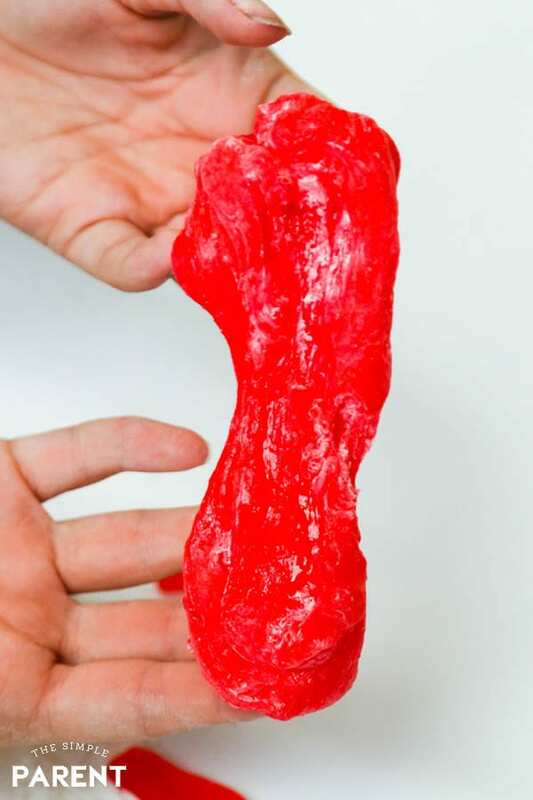 This candy slime involves getting the candy very hot. VERY HOT. This is not a slime for kids to mix together on their own. 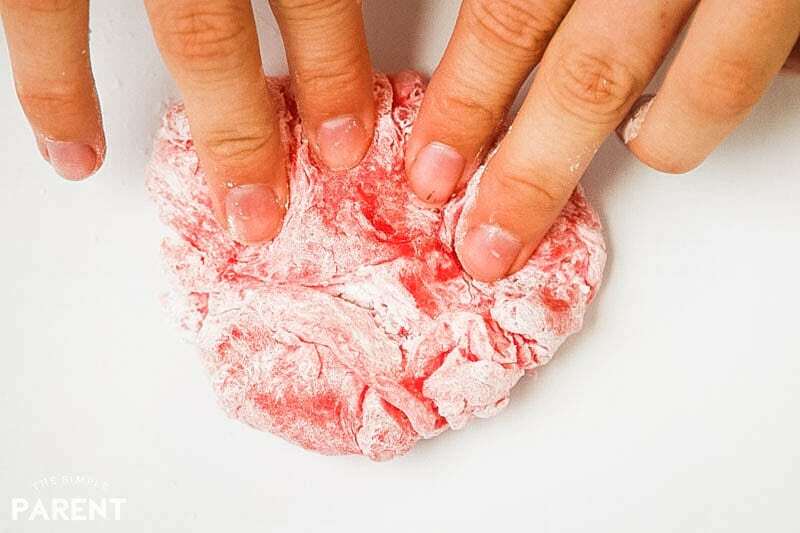 This slime recipe requires a lot of adult help as you put the edible slime ingredients together. IT’S NOT FOR YOUNG KIDS despite the fact that it’s edible. I’ll warn you about this again later. It’s that important. The great thing about making edible slime is that the ingredient list is very short. If you’ve tried some of our other slime recipes then you know that we like to keep them pretty simple. For this recipe, we need just two ingredients but they’re very different from our usual slime ingredients. Just like most slime recipes, the amounts aren’t set in stone. You’ll have to play with the amount of powdered sugar you need to get the consistency you want for your slime. To start, place about half a bag of Swedish Fish in a microwave-safe bowl. Heat the candy on high in 15-second increments until they start to get melty and the shape begins to break down. You want them to still be gummy when you stir them but melty enough to be able to be mixed together. WARNING: THE CANDY WILL BE VERY HOT. Once the Swedish Fish are melty, add powdered sugar into the bowl and stir. The candy slime will start to get lumpy. Continue stirring and folding the powdered sugar into the candy. Once the mixture has cooled from hot to warm and is a temperature you can hold, begin to knead the candy slime into one piece. PLEASE BE CAREFUL. If you squeeze the slime with your hands and it isn’t cool, it will burn you. This step is not for kids to do on their own. If your hands are sticky as you knead it, add more powdered sugar. As you work it, it gets even easier. Once it’s cooled down, the kids can play with it and then… eat it! That is the magic of edible slime! Q: Can you use any gummy candies to make edible slime? A: You can! 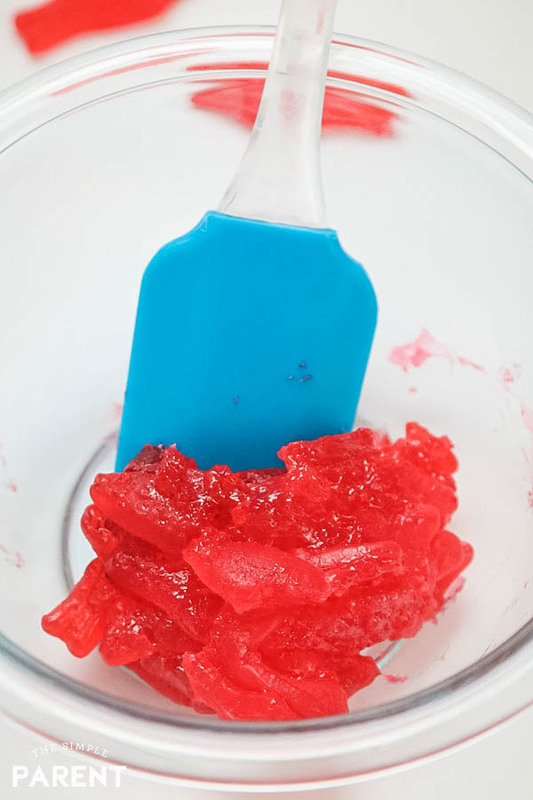 We also love this gummy bear edible slime recipe! 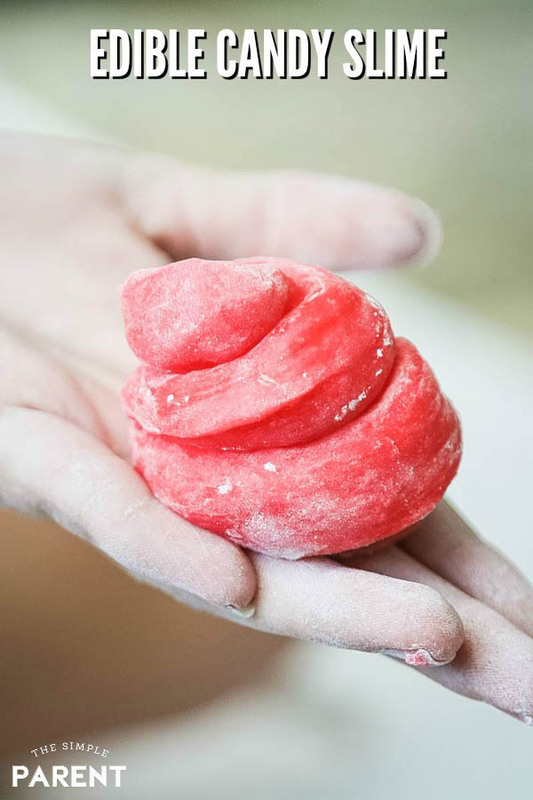 Q: How do you make edible slime without cornstarch? A: Easy! You use powdered sugar! It makes it super sweet but super fun too! Q: What are the ingredients for edible slime? A: This recipe uses Swedish Fish and powdered sugar. Q: How do you store edible slime? A: If you have any slime leftover (and it doesn’t all get eaten), you can store it in a sealed container for a day or two. Q: How hard is it to clean up edible slime? A: This candy slime cleans off surfaces and hands with soap and water. Edible slime really is a fun option! Just be sure to make it safely and supervise your kids the entire time! Comment and tell us what kind of edible slime you’d like to see us make next! Edible slime is so much fun! Talk about playing with your food. I love the idea of making it out of the kids’ favorite candy. They just have to know that they can’t eat just anything sweet looking. Sour patch kids slime my kids would love. My son would love this too! We might have to give it a try! That’s one of my favorite candies! I would like to see you make slime out of JuJu candies. My kids are obsessed with slime! I can’t wait to try this version with them. I make slime with them all the time so this is a nice little switch from the regular slime. Now this is something we’ve never tried! Very cool. It might be a fun hands-on party idea! This slime looks awesome. I can see why you wouldn’t let kids p it together alone, but they can definitely get a kick out of it if it’s made. I myself have a weakness for Swedish Fish. There’s something about them that makes them irresistible, I have a hard time controlling myself if I have a bag. Yes!! Once I start eating them it’s game on!! There will be none left! Edible slime!? How FUN! 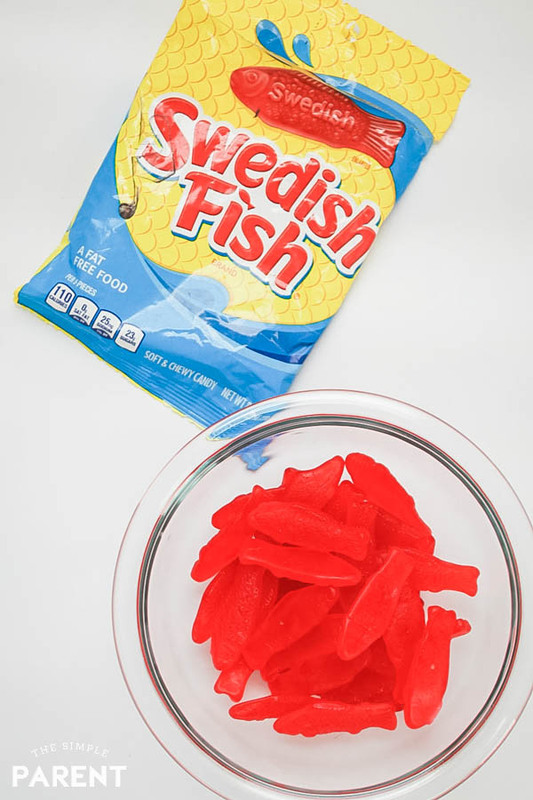 I love that you used Swedish Fish – those are one of my favorite kinds of candy. I love Swedish fish and have not had those tasty snacks in years. You officially made me hungry for them. I love the slime idea! Yum!! How about a cowtail slime? Oooooh I’m intrigued by how this might turn out! How about making a hot jalapeno slime next? This looks pretty fun! Swedish Fish are my fave kind of candy so I am partial to them! Any that resemble sea creatures! I think it would be fun to incorporate something like sprinkles! I need to try making this. So much fun. I would love to try it using Fuzzy Peaches or Hot Lips candy. Hmm, maybe skittles! I love skittles or even starburst would be good. How fun is that! My favorite candy is chocolate, but I don’t know if you can make that into slime. What do you think? 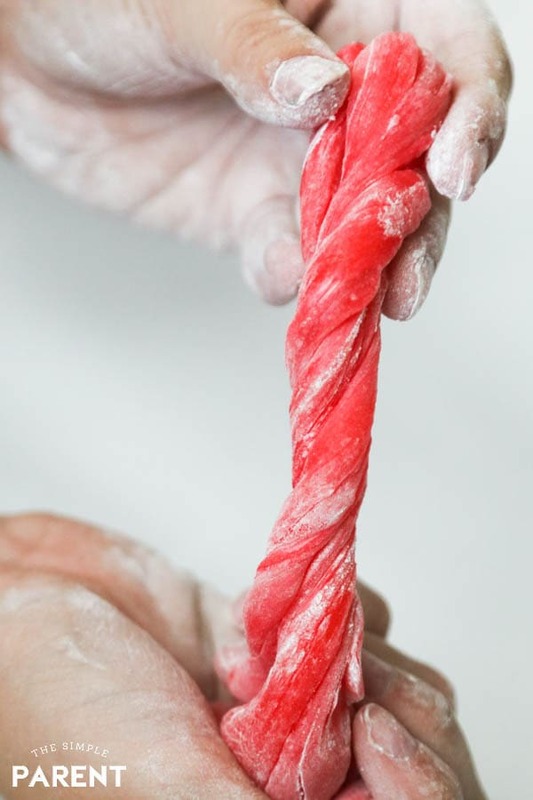 Laughy Taffy would be amazing. I would like you to make the 2-Ingredient Ocean Slime one next, these sound so great. Will have to make some with my five year old grandson sometime. I’d like to see Twizzler slime. That would be my favorite. Cotton candy slime would be awesome! I think I would make some with either starburst or sour patch kids!! This is so clever and looks like fun! I’d like to see slime made out of Mike and Ike’s….my daughter’s favorite candy. Maybe something sour and with sprinkles! I love these slime recipes! My daughter (AND I!!!) are obsessed with slime. It’s something about the texture! This literally looks so good. Would love to try this! I’d like to see the cinnabear gummies made into slime! Lime jelly belly slime would be awesome! I would love Sour Patch flavor!! I wonder if you could do slime with mike and Ike’s or sour patch kids? I would make gummy bear slime. I would love it if you made Dots slime! I grew up eating that candy! I’d love a gummy bear slime. That’s my favorite chewy candy. This is definitely not something that had even entered my head before, but I know the grandkids would love it. I think any of the slightly tart gummy types of candy would be good–maybe cut the sweetness a little. I want slime that is lime flavored. This edible slime is so fun. Red Hots or Cinnamon would be good! Hmmm……maybe some odd gummi stuff. Maybe gummi colas or bears or worms. My kids would love the swedish fish slime for sure. Is it possible to make some chocolate flavored slime? I think edible slime made out of pudding mix might be fun…banana cream, maybe. I’d like to see you make key lime slime! Oh this is one thing I have not tried at home is making slime! I really have to try it! One that would be fun this time of year…is trying to make one with candy corn for Halloween! Some kind of unicorn slime would be fun. I think my son would like Sour Patch Kids slime. I would love to make the slime out of Dots. All the suggestions are great and it would be so fun for the kids! I bet you could make Sour Patch Kids slime. I never thought about edible slime before but I bet my nephew would enjoy this. I’m not sure what kind should be next. You can’t top Swedish Fish!! Maybe pineapple gummi bears? My kids said they want airheads slime! Maybe a rainbow slime using Starburst candies? I’d like to see sour patch kids slime. Oh my goodness, I’m sure this would be hard but what about a lime flavored slime? 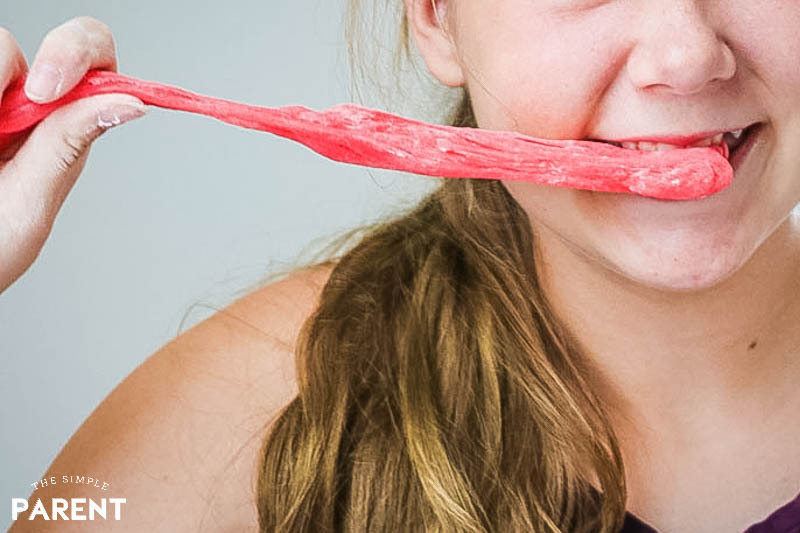 —> licorice candy slime !!! How about slime made out of Nutella!? I think that it would be delicious! My kids like sour candy. Can you make sour patch kids slime? 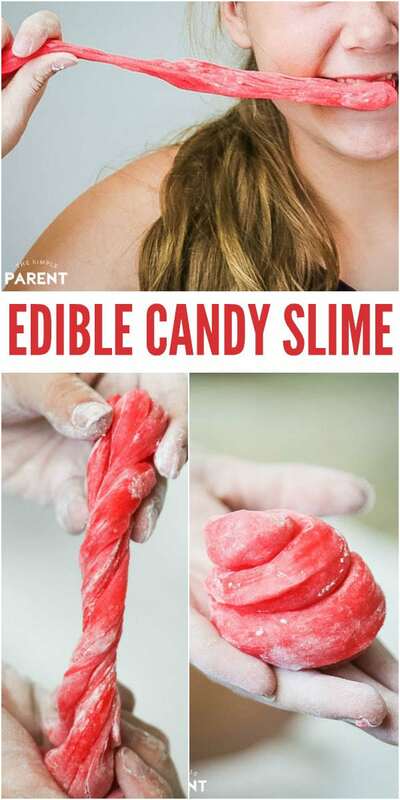 This edible slime looks yummy! Can’t wait to make it this weekend.